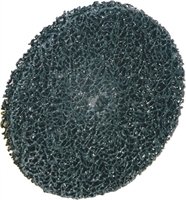 Applications: Plain discs are used in a number of ways. They can be mounted onto shaft drive machines (instead of grinding wheels and polishing mops etc). The discs are normally used end-on to clean smaller areas or shaped objects. Use to clean and strip grime, rust, paint, vanish and other unwanted coatings. Will leave a brushed finish on stainless steel. Product Notes: Can be fitted to a metal shaft assembly to which 1 or 2 discs can be added to make a single or double width wheel for mounting in a chuck or collet. This system of re-usable shafts give a secure industrial grade assembly. Use appropriate protection: these discs strip fast. Also Available: Shaft assembly/mandrel for fitting the discs. If you want to use just 1 disc on a shaft all the time, we also have shaft mounted discs, ready for use. For larger areas, fibre backed stripping discs for angle grinders are available.